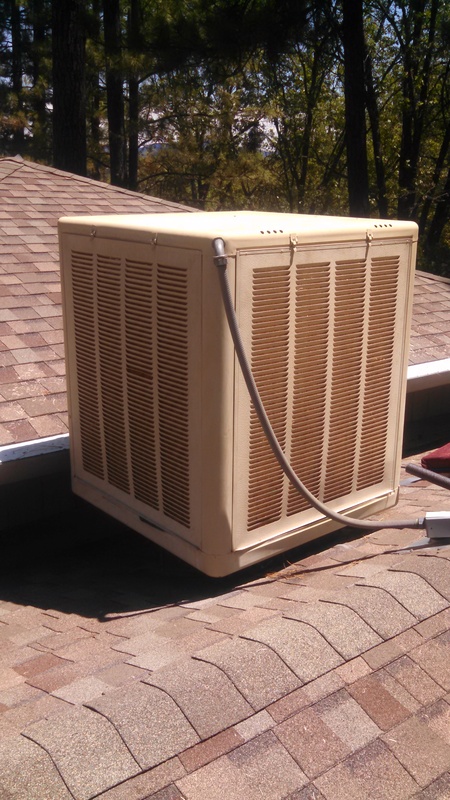 Improving Evaporative Cooler Performance | 15000 Inc.
My wife, Linda, and I have a cabin in a hot, dry, little town no one has ever heard of – Groveland, California. Summertime temperatures regularly reach above the 100 degree mark. The cabin came with a rooftop evaporative cooler, AKA “swamp cooler”. 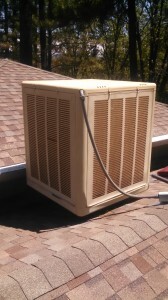 The unit seemed to provide some cooling until the outside air temperature reaches over 95 degrees. At that point it seems to blow nothing but hot air, not unlike the author. After a few days of sweating like a dog (no offense Bandit!) I decided to go “all-engineer” on it. Whipping out my portable calculator/telecommunication device/inter-web searcher, I began to research the problem. One southern gentleman suggested the problem could be inadequate water flow. He had added a second spray pump and doubled the distribution nozzles to each media bank. “Now this sounds like a real engineered solution”, I thought! I was ready to run to the hardware store and spend a hundred dollars on supplies to turbo-charge my swamp cooler. Fortunately I did a little more research. There were quite a number of good-ole-boys who were suggesting a much simpler solution. The recommendation was to get rid of the high-tech, multi-season, blue foam media and install two thicknesses of the old style “Aspen” media. 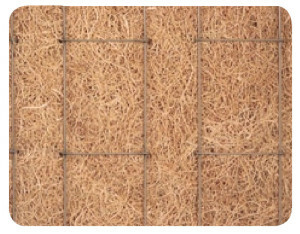 This is the media that looks like curly straw – and is cheaper than the new and improved blue foam media ($4 vs almost $6). 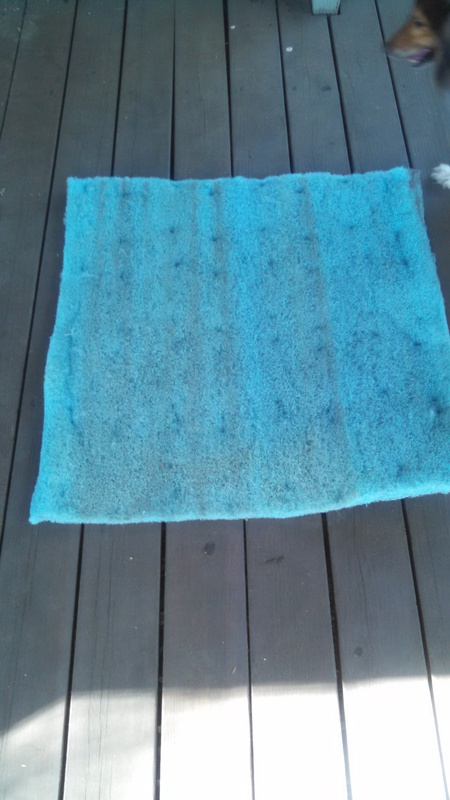 The Blue Foam Media – Note the wetted areas are clean and the dry areas are dirty. 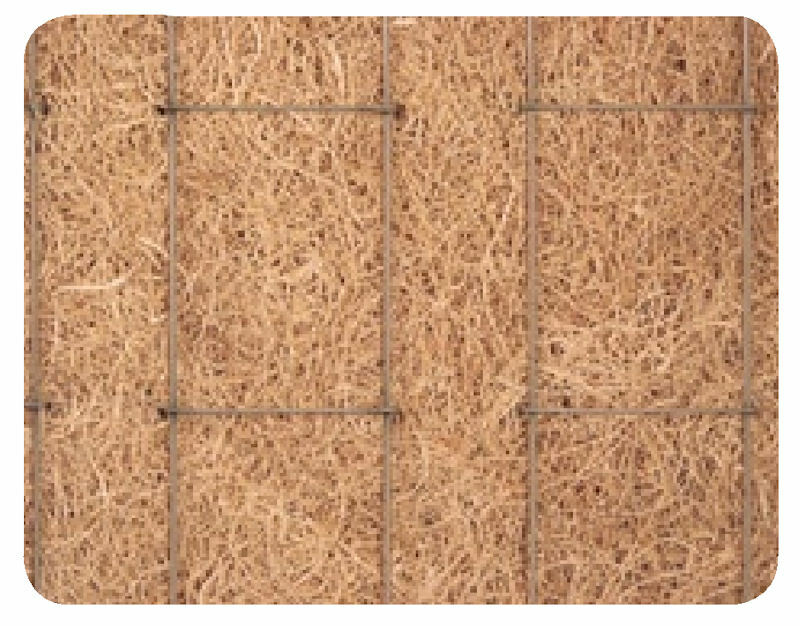 Dry areas mean no evaporation is taking place which reduces efficiency. Since this was a cheaper, easier, solution than installing a new pumping system I decided to give it a try. Outside air temp. at the roof = 95 deg. F.
Supply air temp. at the evap. cooler outlet = 84 deg. F.
Temp. difference from evap. cooler (95 – 84) = 11 deg. F.
Room temp. (extremely uncomfortable!) = 89 deg. F.
The temperature at the roof – 95 deg. F.
I made a quick run to the Lowes store in Sonora and found the Aspen media available in many sizes. Back at home, on the cabin roof, I found it was quite easy to fit two thicknesses of the Aspen media into the swamp cooler panel frame. It took only 15 minutes to install the eight panels of media onto the four sides. I let the pump run without the fan for about 10 minutes to let the media get fully wet. In the meantime I again used a digital thermometer to take measurements of the temperature at the roof and the room temperate. 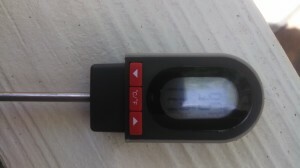 I then stuck the digital thermometer into the supply air outlet of the swamp cooler and turned the fan and pump on high. Supply air temp. at the evap. cooler outlet = 62 deg. F.
Temp. difference from evap. cooler (96 – 62) = 33 deg. F.
Room temp. after two hours = 75 deg. 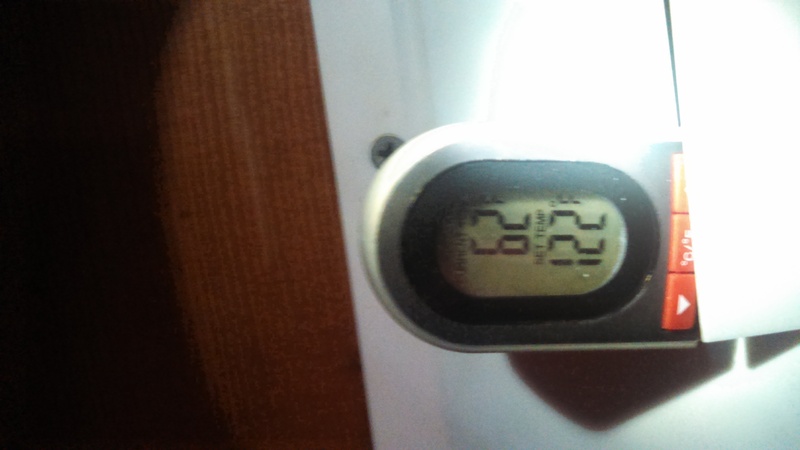 F.
The digital thermometer in the supply grille from the evaporative cooler – a frigid 62 degrees! The old-school Aspen media resulted in a whopping 33 degree temp difference between the incoming outside air and the room supply air. 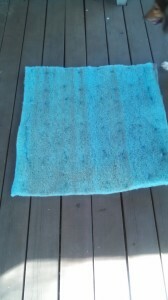 The “new and improved” blue foam media could only achieve a 11 degree temperature difference. In an era when rapid change has become a normal part of our lives, it is somewhat comforting to find the “old” way is, sometimes, still the best way. My wife Linda was more than a little impressed with my inexpensive solution to the problem. It is good to remind her that, as annoying as my “engineer attitude” can be, every once in a while there is some benefit to having married a dork.